It has been made apparent that there is indeed a beginning to our world, assumed to be 13.8 billion years ago. It all began with a large explosion, and ever since the universe has found itself in a state of cooling while simultaneously continuing to expand. The earth was born amidst this process of expansion and cooling, and life was consequently conceived. Primordial conditions were chaotic, yet differentiation occurred with the passing of time and the gradual decrease in energy, giving rise to a sense of order, and eventually arriving at a state of stability. Tracing back, one can say that there have been various primordial beginnings throughout the course of history from the primordial beginnings of the universe, the galaxy, the sun, the earth, to that of living things. In the primordial conditions of such systems of all there is always a sense of chaos. The “Omizue” performance that took place on August 19th 2016 on the coast of Kohamacho in Masuda City, Shimane Prefecture, served to express such primordial origins by means of a physical experience. A total of approximately thirty members participated in the ceremony. The ceremony commenced at eight o’clock in the morning. It was a ritual that borrowed from the format of the tea ceremony. August’s morning sun had begun to rise into the eastern sky, its bright light engraving deep shadows on the ocean and land. The guest moved eastwards along the shore from the waiting area, making their way to the sandy beach where the ceremony was to be held. It was a purified space on the beach, surrounded by four boulders. The boulders clearly separated the inside and outside of the space like a barrier. A wooden platform measuring two square meters on each side was installed in the rocky area along the seafront. This room of sorts was referred to as the “Omizuedo” (setting for the Omizue ceremony), and a large sheet of washi paper was laid out to cover the surface within. The ceremony was hosted by Yukinori Maeda and Sumiko Ishii. In each session there were two assistants to the hosts, and three guests. One by one, each guest would take off their shoes, and be seated. The constant crashing of waves against the rocks at times brought a light spray across my cheeks, enabling me to feel more clearly the strong winds that carried across the ocean. One of the hosts began by explaining the purpose of the ceremony to the guests. He said, “We have prepared for you many blessings that are based on the impressions we have formed during our journeys in Iwami. We hope they will be to your liking.” This was followed by a reading of the “Yama-umi-kawa-kami” poem (p.8) that was written on washi paper. He slowly and quietly opened out the Sekishu-Washi paper that had been crumpled, folded, and placed to the side, allowing the guests to observe the entire process. The washi paper was infused with plants and seaweed native to the mountains, ocean, and rivers of Iwami. One could hear the sounds of the washi paper being unfolded. The paper, held in both hands, was then presented to the guests for a closer look. The washi paper fluttered in the gusts of wind coming in from the ocean. Thereafter, the guests received Japanese confectioneries made with salt extracted from local seawater. This was followed by the gift of water. This was spring water collected from near the source of the Takatsu River, a clear tributary that flows from the Chugoku Mountains into the Sea of Japan. The vessels for serving the water were made from Iwami’s soil. Each participant received one serving of water. After the guests enjoyed their gift of water, they departed from the Omizuedo. During the ceremony, a dragon made of straw, that had been hanging from the side of the Omizuedo, was immersed in the ocean. The two ceremonial assistants carried the straw dragon out from the ocean and, taking firm, certain steps, walked seven and a half times in a circle. While this was happening, the hosts remained in the Omizuedo and read out a text written on the Sekishu-Washi paper. There words could not be heard, lost amidst the roaring of the sea. From beginning to end, the surge of approaching waves came crashing in with a deafening roar and the morning light of the August sun, in its increasing brightness, illuminated all that lay beneath it. A solemn atmosphere had permeated the ceremony. A natural barrier of boulders surrounded the site. 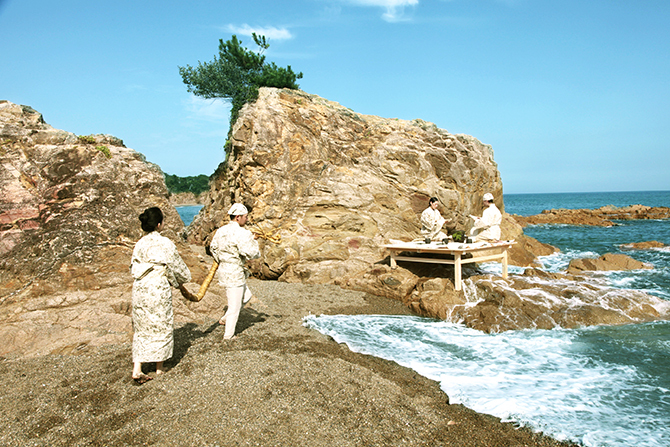 In this natural setting, a series of ceremonious acts were carried out by human hands from a heartfelt hospitality that symbolically brought together the essence of Iwami and the gift of water. A certain sense of unity between nature, the hosts, and their guests emerged from the sharing all of these elements, leaving one with a sense of awe and admiration towards God. Before God first proclaimed “Let there be light” and brought about the existence of light, the world had been a place where “the earth was waste and void; and darkness was upon the face of the deep: and the Spirit of God moved upon the face of the waters.” 2 It was a world in which “the young land floated like a tallow on water, drifting like a jellyfish.” 3 It was an experience of delving into nature’s primordial state, which essentially exists as an indifferent entity. The mode of recognition by which words and concepts are used to classify the various elements of nature is something that has dominated our lives through the present day. Our consciousness is indeed deeply immersed in this way of perceiving the world. From mountain, ocean, river, sand, rock, grass, water, sky, cloud, light, wind, sound to scent; hadn’t these entities that were made discrete with words and concepts, been part of a single whole? Were we not ourselves once a part of this whole? And don’t such primordial forms and conditions still persist through the passage of time? This was an experience that provoked such thoughts. From the words and objects presented in the ceremony, one could discern that this was an attempt to make a symbolic return to primordial conditions and to achieve “the unification of that which is divided.” The “Yama-umi-kawa-kami” poem that was read out at the beginning, started with the phrase “everything was together as one but over time had been divided into two,” and came to a close with, “the mountains, oceans, and rivers come together as one,” repeated by three individuals representing the elements of “yama-umi-kawa” (mountain, ocean, river). The paper garments called “Yama-kami Kamikoromo” were made with trees and plants gathered from the local region. The “Umi-kami Kamikoromo” were made with paper infused with seaweed, and the “Kawa-kami Kamikoromo” with paper infused with water plants. The “Oto-kami (Sound Paper) / Yama-umi-kawa-kami”, that the hosts of the ceremony unfolded before our eyes, was made with all of these elements. In addition, from the fact that the “Yama-kami Kamikoromo” was made by a papermaker who lives near the ocean, and the “Umi-kami Kamikoromo,” “Kawa-kami Kamikoromo” and “Oto-kami (Sound Paper) / Yama-umi-kawa-kami” were made by a papermaker who lives in the mountains, one can also see an intention to bring the mountains and ocean together in harmony with one another while simultaneously treating them in a contrasting way. If we were to recognize that one of the primary functions of a ceremony is to instill us with the sensation of returning to our primordial beginnings, then the theme of the “Omizue” did indeed adhere to this concept. This was also apparent in the intuitive selection and use of the tools for this ceremony. The Iwami region is located in the western part of Shimane Prefecture. The prefecture has a long coastline facing the Sea of Japan, and borders the Hiroshima Prefecture to its south and the Yamaguchi Prefecture to its west. As the name ‘Iwami’ (which literally means, ‘seeing rock’) suggests, the mountainous area extends quite close to the coast. There is very little flat land, and the scenes of waves crashing against the coastal cliffs is impressive. The Iwami Ginzan Silver Mine and its Cultural Landscape has recently been designated as a UNESCO World Heritage Site, and Sekishu-Bashi: papermaking in the Iwami region has also been listed in UNESCO’s Representative List of the Intangible Cultural Heritage of Humanity. In this sense, even from a global perspective it is a region that brims with unique features and a rich cultural environment. Masuda City, which was the setting for the “Omizue,” is located on the western edge of the Iwami region. The city is in the downstream area of the Takatsu River, which flows from the Chugoku Mountains up north and into the Sea of Japan. It was built on Iwami’s largest plain, the Masuda Plain. Takatsu River has been proven to have the highest water quality among all domestic first-class rivers. The water served at the “Omizue” was collected in the town of Hikimi, in the mountainous region of the Masuda area. It is a forest region surrounded by mountain ranges reaching 1000-meters in height. The Hikimi River, with its source near the bordering Hiroshima Prefecture, flows to the west side of the town, joining the aforementioned Takatsu River downstream. The gorge formed by the Hikimi River is especially known for its beautiful autumn scenery. Against the backdrop of its historically rich natural environment, traces of human life dating back to the Paleolithic age from 12,000 to 30,000 years ago have been discovered4, as well as many ruins from the Jomon period. Beyond the river terraces that extend along the Shiso River are several important Jomon ruins such as the Ishigatsubo Ruins 5 and the Mizutanokami Ruins 6. Numerous pottery and stoneware artifacts from the middle to the late Jomon period were excavated from the Ishigatsubo Ruins along with pit-type dwellings and remains of collected stones from the time. Amongst these excavated objects, fragments of Namiki-style and Ataka-style pottery native to the Kyushu region have gained much attention as proof of the exchanges between peoples of the time. At the Mizutanokami Ruins there are a series of rocks each approximately one meter wide grouped together in a large circle measuring seventy meters in diameter. Here, earthenware and stoneware including religious relics such as Dogu and Doban (dolls and plates made of clay) as well as jewelry like Magatama and Kudatama (comma and tube-shaped beads) have been excavated. A fragment from a bronze dagger-axe that would have been used in rituals in the Yayoi period was also unearthed from the same site. Many similar artifacts have been excavated throughout the northern Kyushu region and are thought to have been made in the Korean Peninsula during the early Yayoi period or else very early examples of objects produced in Japan 7. There is also the possibility that it was brought to Hikimi along with the introduction of rice agriculture to the east 8. It is indeed meaningful to be able to come close to the actual lives, exchanges and spiritual activities of people from the Jomon era through such remains and relics. When one considers these historical traces, the Jomon elements among the tools used in the “Omizue” and the accompanying exhibition naturally come to rely on actual history itself, further deepening the impressions that they convey. In addition, the dance of the straw dragon that brought the “Omizue” to a close derives from the folk beliefs of the Iwami region that have been passed down since ancient times. Following the aforementioned Takatsu River upstream, one arrives at its source in the town of Yoshika, located in the Chugoku Mountains. Here, there is a small pond known as Daijagaike (which means, ‘big snake’s pond’), and next to it stands a large Japanese cedar tree with branches stretching extraordinarily wide. Marshy grasslands extend throughout the area. Every June a Shinto ritual is held here to pray for rain. People carry a dragon or snake-like creature made of straw into the pond, submerging it in the water, making it dance up and down, and finally offer it to the cedar tree. The Wara Ryu (straw dragon) also appears in Omoto Kagura that has been passed down throughout the Iwami region. Omoto Kagura is a Shinto theatrical dance that celebrates the “Omotoshin,” the ancestral god of each district, that has been passed down through generations in the mountainous areas of the Iwami region. In this Kagura, the Omotoshin is welcomed in the form of a straw snake referred to as the “Takutsuna,” and is placed on the altar in its spiraling state. At the end of the Kagura that takes place throughout the night, the straw snake is hung from the canopy and shaken violently. At times it experiences a divine possession, and an oracle is delivered. At dawn the straw snake is returned to the world of the gods, and comes to rest as it is wrapped around the sacred tree9. By tracing the symbolism of the straw dragon of the “Omizue” to these traditional Shinto rituals of the Iwami region, one is reminded of the ways of a world in which God and man intimately, and harmoniously coexist with one another. The format of the tea ceremony is appropriated in order to materialize and symbolically convey the gods in the state in which they had existed prior to their personification. It is an act of communication in its most pure and hospitable form. Here, the distinction between host and guest, or subject and object is clearly apparent, and the genuine purity harbored within the act of communication becomes prominent. In the earliest primordial conditions, the gods inhabited everything that was in existence. Divinity is rooted in the land and the earth exists as an aggregate body of various regions. If one were to take the view that it is only a difference in scale, then one could say that each region, the entire earth, and even the universe are all inherently the same thing. The scale at which one looks at something can create great differences in our recognition. By changing the scale of our recognition and how we consider things in time and space, we are able to see the things that we could not see, and notice the things that we could not notice. If I were to change the way that I look at this vessel that I hold in my hand, I could see that it is the soil of Iwami, an aggregation of molecules, and furthermore, a collection of elementary particles. In this way, looking at an object as simply an object is no longer enough. The very same thing can be said for nature’s constituents such as the mountains, oceans, and rivers. The act of serving and receiving the organic substance of spring water into the body. The spring water eventually passes through the human body into nature, and continues to circulate around the earth. Where does the water served come from, and where does it go? The water that is within our bodies for a fleeting moment in the midst of this great cycle is at the same time the water from the ocean that extends before our eyes, the clouds that hang in the vast sky, the water that flows through underground streams, and the water of the rivers that connect the mountains to the oceans. It is the rain that falls on the earth and it is the water vapor that is contained in the atmosphere. The earth is filled with the richness of water. It was in this water that living beings with organic structures were miraculously conceived. One wonders at how mankind, as one such living creature, senses beauty in the glitter of sunlight that is reflected on the surface of the ocean. And one wonders at being able to experience this sensation together with others. The reason that we find beauty in the evening sky and oceans set ablaze under the setting sun is perhaps because we, in that very moment, sense the passage of time and ephemerality. We can witness with our very own eyes that this very moment can only exist precisely at this moment in time. If we were to consider everything from this perspective, then all things are indeed precious. The day comes to an end, and the sun rises again the following morning. Although time appears to follow a cycle, it is never the same. Knowing the process from the beginning of the universe through to our current time, it is clearly evident that time always and only progresses forward. It appears to repeat in a cycle, yet in reality it only happens once. Its everlasting providence is that it is always in flux. It is also a known fact that this planet that was born 4.6 billion years ago will come to end its existence in another 5 billion years with the extinction of the sun. Everything is part of the same universe, and everything is always changing. < The silent furnace of the unknown gives birth to a new light.